NASA just released this stunning new photo of the International Space Station. The sun is just past the sliver of Earth's horizon, beautifully illuminating the newly installed solar arrays. The photo itself is absolutely gorgeous, there's really no other word for it. Over the last 51 years NASA has been the source of some of the most iconic images in seen around the world today. For my money, this one just released made the list among the best of the best. I've put together five of my absolute favorite shots from NASA's manned space program. I had to limit myself because I could easily have done my ten, twenty, even fifty favorite shots, there's just so many to choose from. I tried to include both some popular ones, but also some lesser known shots, ones that really show the wonders of manned space flight. When Neil Armstrong and Buzz Aldrin became the first two people to walk on the surface of another world on July 20, 1969, history was made. The simplicity of this photo makes it the most iconic photo from the mission. The image really says it all. There is a human being standing on the moon. I love this photo because it represents the spirit of exploration. It really has it all, astronaut, the lunar lander, the command module, Earth hundreds of miles below, and the blackness of space beyond. When I first saw this picture, I didn't believe it was real. It was just too good. Taken from an unmanned supply probe this picture really represents the end of the Cold War. The US space shuttle docked at Russia's old Mir space station while the crews collaborate on scientific research. This spectacular picture taken of the Aurora Australis was taken during a heightened solar activity, making them appear even more spectacular. Here you can get a peek at the tremendous team effort that goes into every aspect of a space flight. For every one person to fly into space, it takes hundreds of people back on Earth have to make sure the crew return safely. Here you can see astronauts Neil Armstrong and David Scott waiting for the recovery teams after a particularly rocky mission aboard Gemini 8. Read the rest of the post . . .
Well, technically it happens tomorrow, but I won't be able to post on the weekend so we might as well get the celebrations kicking a day early. 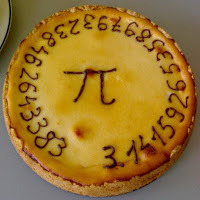 Pi day celebrates the achievements of the most famous of ratios, the ratio of a circle's circumference to its diameter. The distance around the circle is just about three and one seventh times its diameter, 3.14 times to be more exact. 3.1415927 times to be even more exact, 3.14159265358979323846264338327950288419716939937510... to be yet more exact, and so on. March 14th is always celebrated as Pi Day because it written out as 3/14 (this year it's offical for the first time). By a startling coincidence, it also happens to be Albert Einstein's birthday. Is it just me or do the stones of Stonehenge already look a lot like the letter Pi on their own? That got me thinking. The monument we should build should take inspiration from these stone builders of ancient times. I'm thinking a huge ring of great granite Pi symbols with five big ones in a horseshoe shape in the middle, much like the real Stonehenge. The ancient builders oriented the structure so the sun rose between the biggest stones on the solstices. Borrowing that idea, our Pi-henge would line up so that the sun rose in the middle of the great stones on the 14th of March every year. In 1618, Johannes Kepler formulated three laws of planetary motion that bear his name. He used data gathered by the eccentric observational astronomer, Tycho Brahe. Legend has it that Kepler covertly acquired the data from a stubborn Tycho. The three empirical laws describe general properties of planets following elliptical orbits. The first law states that planets move in ellipses with the Sun at one focus. The second law states that a planet will sweep out the same amount of area during the same amount of time thoughout its orbit. The third states that the square of the period (planetary year) is proprtional its average distance from the Sun. These laws later turned out to be accurate consequences of Newtons law of gravity. Four hundred years later, we are still using Kepler's laws to search for more planets beyond our solar system. 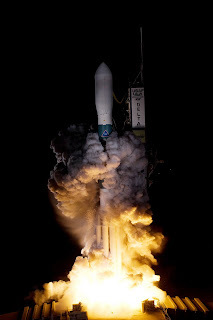 On March 6th 2009, NASA launched the first satellite designed specifically for hunting extrasolar planets (or exoplanets). The satellite is appropriately named Kepler. It contains a 1 meter diameter telescope that mesures the light intensity of stars. The advantage that Kepler has over ground based telescopes is that it won't have to look though Earth's atmosphere. The atomosphere is what causes stars to twinkle and interferes often interferes with observations. However, some astronomers are working to cancel out such atmospheric problems. 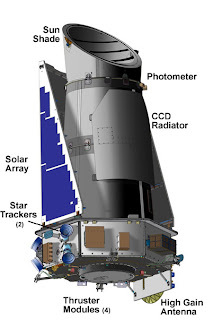 The Kepler mission will search for planets around 100,000 stars for over three and a half years. This field of view is roughly the area of the sky that your hand covers when held out at arm's length. There are several methods for discovering exoplanets depending on how its orbit is oriented when we view it. Kepler will look for exoplanets that cross between us and their parent star. When this happens, the parent star appears slight more dim. This is precisely what Kepler is built to observe. If a star becomes dim on a regular basis then that indicates that a planet is passing in front of it. This is called the transit method. 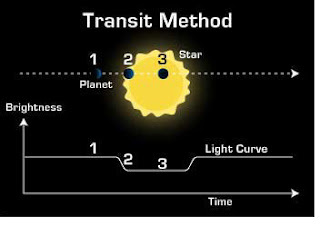 The probablility that a planet's orbit is oriented correctly for the transit method is only 0.5% . And the planet will only dim the star's brightness by one ten thousandth over a few hours. With these low odds and high hurdles, Kelper's mission looks dim. Given this small probabilty, there are still about 500 Earth-like planets that waiting for Kepler! The first extrasolar planet was discovered in 1992. Since then, searching for exoplanets has significantly increased. The current count of known exoplanets is 342. Many astrophysicists hope to discover an exoplanet that is similar to our Earth. An Earthlike planet could contain water or even life! Aside from discovering alien life, an exo-Earth would also offer hints about the formation of our own solar system. 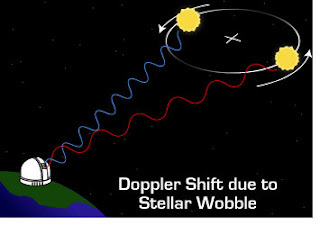 Most of the known exoplanets were found using the wobble method. If an exoplanet's orbit is tilted slightly from our point of view, then it will not transit on front of its parent star. Detection of such a planet requires a different method. The orbit of a planet is caused by the force of gravity of the parent star pulling on the planet. However, Newton's 3rd law requires that the planet also pulls on the star. This casues the star to wobble very slightly. As a result the light from the star will vary its frequency very slightly. This is due to the Doppler effect. You often observe the Doppler effect of sound waves when a train is coming and going. Geoff Marcy from the University of California at Berkeley is the pioneer of this method. He discovered 70 of the first 100 exoplanets and some of his students hope to discover moons orbiting those planets. The Washington Post is reporting today that the nomination of John Holdren for the top presidential science advisor has been held up in Congress. Furthermore his nomination, along with Jane Lubchenco for the National Oceanic and Atmospheric Agency, is reportedly only being blocked by Sen. Robert Menendez (D-N.J.) to call attention to an unrelated Cuba matter. This is silly. Now is not the time to be playing politics with scientists as pawns. The United States is facing too many critical science related issues from climate change, to an energy crunch, to stem cell research, to be bouncing around important positions like this. Holdren is currently director of the Woods Hole Research Center. Before focusing on the environment and policy, he specialized in plasma physics research. Once confirmed he would be the chief advisor to the president on all science matters. Lubchenco hails from Oregon State University and as head of the NOAA would be in charge of all ocean and atmosphere research conducted by the federal government. The unnamed source who pointed to Menendez as the source of the anonymous hold said it had nothing to do with the qualifications of the individuals. Should Menendez lift the hold, it's likely that Holdren and Lubchenco would be quickly confirmed.